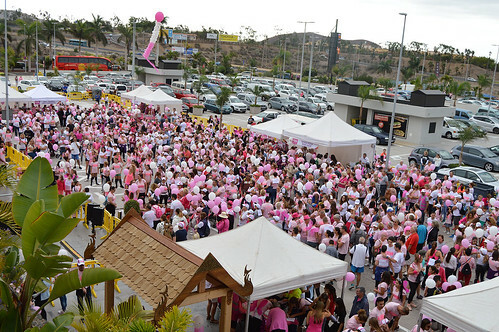 Approaching the Siam Mall starting point, a mother and young daughter skipped along dressed in pink, I thought wouldn´t it be wonderful if the next generation didn´t have the spectre of breast cancer to worry about. 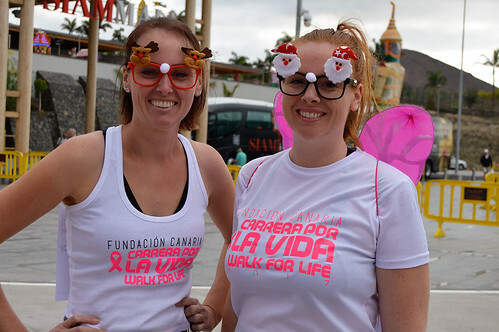 That´s what drives Tenerife´s Walk For Life (carrera por la vida) now in its 13th year it has provided so much support and continues to grow. 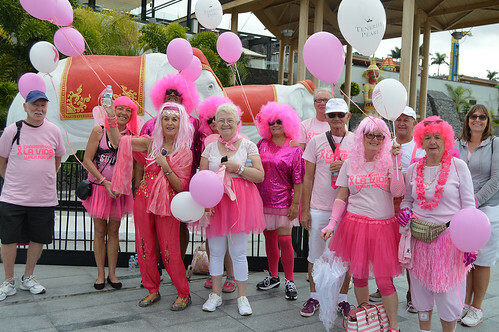 Little annual tweaks to the route and presentation keep it fresh, the forecourt of Siam Mall was packed with people slipping into pink costumes and make up as rousing music and speeches from the stage pumped up the walkers. 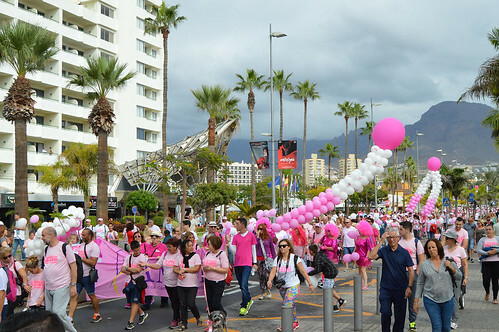 The skies looked a little threatening but they wouldn´t and didn´t dare to spoil the sunshine spilling out from 4, 500 eager entrants. 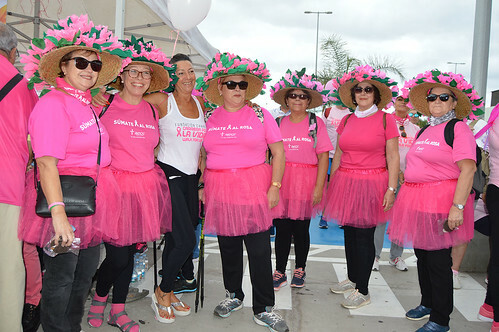 With founder Brigitte Gypen leading from the front, the pink wave surged across the motorway bridge and down past the Magma Centre. 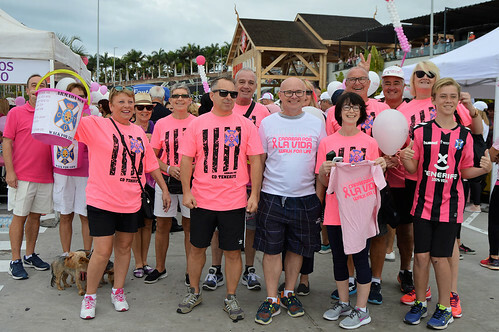 For many the walk was personal, breast cancer touches so many families and the will to prevent, treat, and defeat this disease grows stronger by the year. There were noticeably more men that ever on the walk, and as always the spread of nationalities and communities was as wide as the smiles of reunited friends from previous walks. 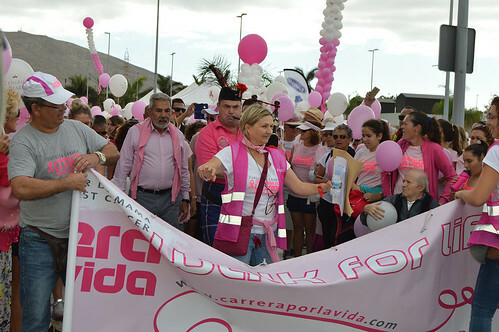 It´s become a major event for Adeje and Arona, holiday makers streamed off the beaches to applaud and cheer as the walkers spread out into Avenida Las Americas. The drum bands were loud and strident and there was plenty of dancing as the clouds parted and the sun poured through. 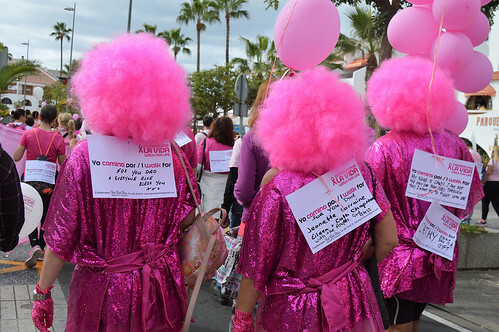 You never know who you will find yourself next to on the walk, pink angels, decorated dogs, and towers of balloons all jostled for space. At times it was difficult to see where the procession started and ended, the distance was 4 kms but noone was counting their steps, the sheer enthusiasm swept everyone along. 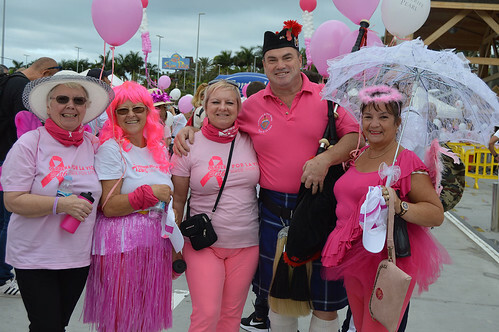 Walkers had loaded up with sponsors in the lead up to the day and spectators were generous in coming forward with change for the bucket collectors. 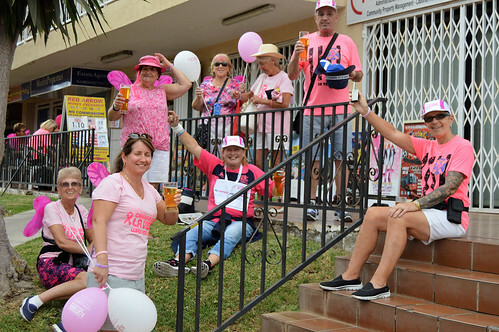 As always I felt great pride as my fellow CD Tenerife fans in the Armada Sur added to their raffle and pink shirt funds with heavily laden buckets for a total of 1,673.07 euros. 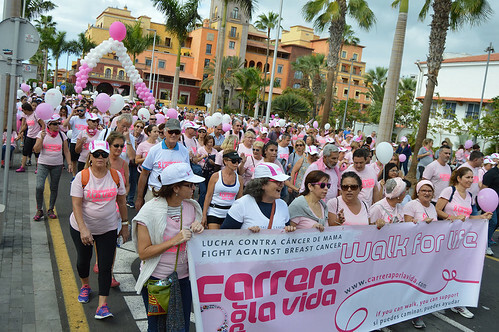 There was a nice refreshing breeze as the finishing straight at Compostela Beach came closer, more music wafted out from the stage and balloons raced up to the sky as they were released from their netting. 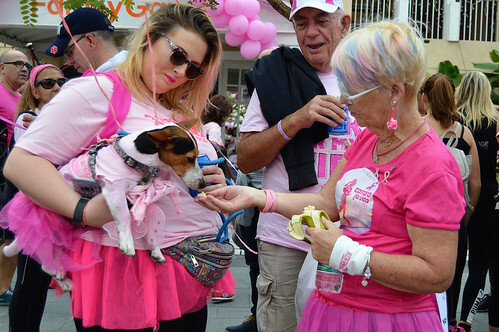 The organisation was spot on, bananas, biscuits, and energy drinks greeted the finishers and a whirl of dancing filled the street. 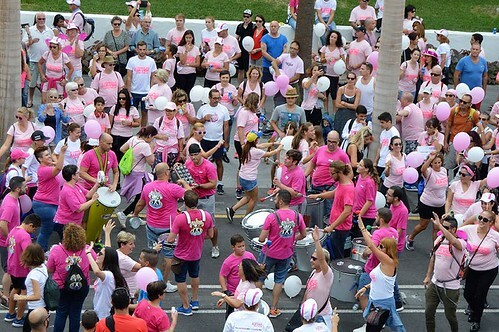 Frantic counting and totting up revealed a new record of just over 20,000 euros raised, a magnificent effort by all. 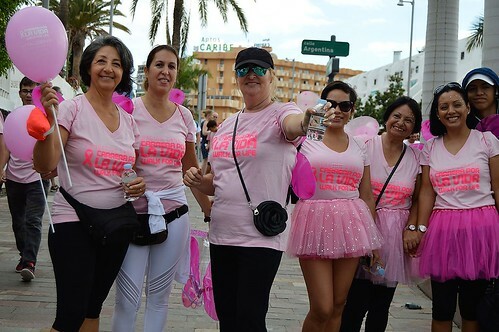 The good work goes on, The Pink Room in Adeje is one of the tangible results of the Walk For Life, somewhere to offer support, advice, and hope. Once again the Walk For Life was an uplifting, inspiring, and a pleasure to be involved in, Massive thanks to all involved – roll on next year.